City Farm School Summer Workshop Series! We hope you are all enjoying a great summer filled with plants, locally grown food and warm weather! We are very active with our outdoor City Farm School on the Loyola Campus! Check often for updates here on garden market updates as well as our amazing upcoming workshop series. Please note that the Concordia Greenhouse is closed to the public until September 2014, re-opening with the Fall semester. 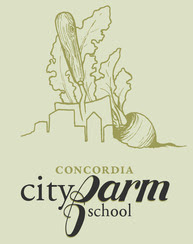 City Farm School staff and interns will be hosting workshops all summer long! All of these workshops are FREE and open to the public! In some cases advanced registration may be requested, see workshop descriptions for more details. SPROUTS: HIGH IN NUTRITION, LOW IN COST! Not all of us can be gardeners, but we all eat! Achieving their maximum nutrient density after only 5-10 days, sprouts are ready to harvest with minimum effort and investment. Learn some practical tips from an experienced ‘sprouter’ on the most accessible greens around! Beginner sprouting kits will be available for purchase at the workshop. Come learn how to grow herbs such as basil, thyme, rosemary, cilantro, dill and sage both indoors or outdoors. We will also demonstrate how to dry and preserve herbs, as well as various uses like cooking with dry and fresh herbs, infusing oils, and medicinal properties and uses. Herbal aphrodisiacs have the power and spirit to send us into raptures, revitalize our bodies, nourish our sexual energy and open our hearts. Come rediscover the ancient wise tradition of using herbs for relaxation, sensuality, and reproductive health. Take homesome juicy recipes and maybe even remind yourself how to be more open and sensual with life in general. and herbs that can be used topically. We will also discuss the issues surrounding Health Canada regulations on the most prevalent cosmetic ingredients and their potential health hazards. different types of mushrooms and their benefits, while constructing homemade kits with the participants. An ideal workshop for those with little to no knowledge on mushroom growing! Previous PostCity Farm School – our summer Loyola campus farm!Next PostUpcoming workshops with City Farm School!